What I like about antiquing/junking my way, is that I find some of the coolest creations and then, without altering a thing, I can pass them along to others. I fell in love with these trees when I saw them. I think they are made from an old mattress or sofa. I imagine someone could cover the entire tree in balls. Maybe spray paint it white or black or green. Drape tinsel garland around it. I, personally, like it the way it is, the tree. What would you do to it? 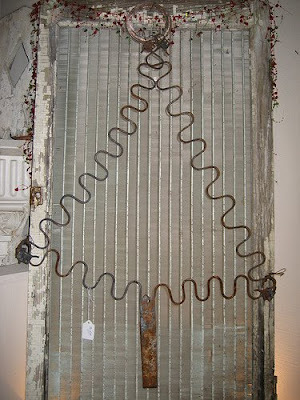 By the way, I have 3 of these trees left, and they are for sale at Primitiques for $15 each. Come and get 'em! The old window screens are extra. Not a dern thing! It's great like it is! I like that. 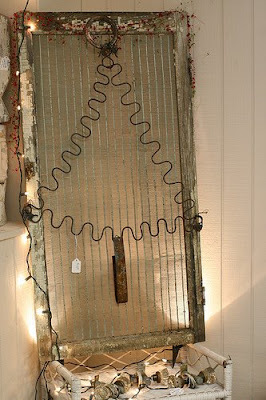 Very simple.It would be cool with string of lights outside. In front of a shed door, in front of the house, what about in a window frame. I know what I would do with it..I would put it in my house is what I would do with it!!! I might be tempted to hang some chandelier crystals from this precious little tree! This is what I need you can hang it on a wall takes up no room adn you can stack presents under it. I really like it on the screen. It almost looks like a framed piece of artwork. I've got some springs just like that from an old chair i took apart. and I've even got some of those old screens. Have you ever woven ribbon through those great old screens? Now those are cool! I'm with you though, I'd leave it just as it is! Great blog....I'm adding you to my favs! Oh I love it as it appears in your photos...with the window screen. Very nice! Sonja, love the shed door idea! Margo, I have never "woven ribbon" (say that 3 times fast) through an old screen. Have you? Show me a picture. Joy, your exuberance is contagious! Welcome, LaurieAnna! I'm glad you found me. I've perused your blog several times. I need to come see you and your store. As is, I have one of these trees at my house...but, it has not found a home yet. Hmmm...Can't decide where to put it.